Scientific evidence explains why the taper is important in training programs. Although the complexities of a group taper can be daunting, the basic structure of a segment of relative rest following the regular season followed by a time of serious training culminating in a taper is a reasonable strategy for team coaches to adopt. Bob Bowman, most recently known for his successful coaching of Michael Phelps in the 2008 Olympic Games in Beijing, offers advice on the planning phase of tapering for elite swimmers. Ric Charlesworth was the national coach of the Australian women’s field hockey team from 1993 - 2000, when they won gold medals at both the 1996 and 2000 Olympic Games. Tapering and Peaking for Optimal Performance offers in-depth discussion of the science, strategy, and program design of the tapering phase of training. 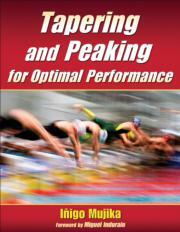 Design optimal tapering plans specific to athletes and the competition. Set realistic performance goals for competition. Avoid negative outcomes associated with a deficient tapering program.